A Suhr Classic Antique in a ready to rock 2-Tone Tobacco Burst, equipped with Suhr's Silent Single Coil System II and a very comfortable Soft V neck. Payments as low as $93/mo. Or, apply & pay as little as $93/mo. Love the 2-Tone Tobacco Burst on this Suhr Custom Classic Antique. Roasted Maple Soft V Neck, ML Standard Single Coils,SSC II, "No Treble Bleed Wiring !!! The whole package - looks,feel, tone ,and great playability. 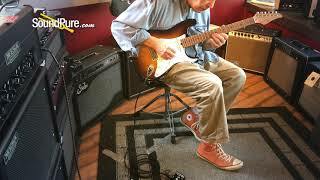 In this video, Sound Pure guitar specialist Eddie Berman tests out a Suhr Classic S Antique 2-Tone Tobacco Burst electric guitar. 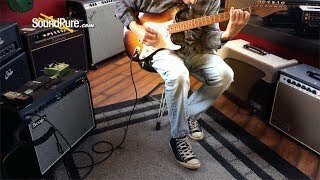 In this video, Sound Pure guitar specialist Eddie Berman tests out a Suhr Classic Antique 2 Tone Tobacco Burst. 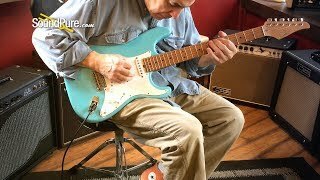 In this video, Sound Pure guitar specialist Eddie Berman is testing out a gorgeous Suhr Classic S Antique Daphne Blue electric guitar. Our customers have asked for an instrument that has a vintage look and feel, without sacrificing playability and tone. Enter the Classic Antique™. We designed this guitar to ensure it preserves the spirit of a vintage instrument while performing like a Suhr. Impeccable craftsmanship and attention to detail ensure that every neck pocket is tight, every fret is perfectly dressed, and that every instrument is ready for peak performance before leaving our facility. The nitro-cellulose lacquer finish and our proprietary antiquing process make each Classic Antique™ feel like it has been loved for years. The Classic Antique now includes: our innovative SSCII (Silent Single-Coil) hum cancelling system, a vintage tinted nitrocellulose neck with stainless steel frets, and a Maple fingerboard option.